Welcome to the ISEA Policy Blog. Catch up on the latest issues related to the adoption of solar and small wind energy in Illinois. We welcome your feedback and referral of newsworthy developments. ISEA hosted a policy webinar Thursday November 3rd, 2016. The subject was "Illinois Energy Bill Negotiations Update" and covered an update on the new RPS that has been negotiated as well as concerns about the proposed rate design and demand charge. Watch the policy webinar here: Illinois Energy Bill Negotiations Update. View the presentation slides here. ISEA hosted a policy webinar Thursday August 25th, 2016. The subject was "Utility Rate Design- Understanding the Changing Impact on Solar" and featured guest expert Kelly Crandall of EQ Research. Watch below to learn more about how rate design impacts solar's affordability. View the slides from this presentation here. ISEA monthly policy webinars are intended to provide the Illinois solar industry with up to date information on current policy activities, as well as educate ISEA business members on opportunities that have the potential increase your business. The ISEA policy committee, comprised of Illinois industry leaders, as well as guest experts, share their knowledge and experience with attendees. **Recordings of previous ISEA policy webinars are made available to ISEA business members. In order to view webinars, log into your ISEA account and then click here. The Illinois Solar Energy Association (ISEA), the state’s leading voice for solar energy businesses and customers for more than 40 years, contends that while fixing the state’s broken renewable portfolio standard (RPS) is crucial to ensuring Illinois does not lose much needed new solar jobs and investments to other Midwestern states, other pieces of ComEd/Exelon’s recently introduced energy bill would significantly hamper solar growth in the state. Lesley McCain, ISEA’s Executive Director maintains that the confusing, complicated demand charges, that ComEd and Exelon propose in the “Next Generation Power Plan”, will harm rooftop solar’s growth. These nationally unprecedented charges mean that consumers will not only be charged for the amount of energy they use, but they will also incur an additional charge based on their highest period of usage in the month. To avoid paying high demand charges Illinois consumers will need to closely monitor their electric use each and every month and limit using numerous appliances simultaneously. Solar owners and energy efficient customers are likely to see their electric bills unfairly increase as demand charges penalize customers who use little energy based on infrequent usage spikes. In addition, ComEd and Exelon are also proposing to greatly reduce net metering the current stable method that reimburses solar owners for the excess power they generate. Currently solar owners receive credit on their power bills for the surplus energy they produce at the same rate that they are charged for it. This excess electricity is then delivered to other customers on the electric grid who pay that same retail rate. This net metering structure helps customers recoup the cost of installing solar systems. The proposed legislation will reduce the amount that solar homeowners are reimbursed for the electricity that they produce from the retail rate to the lower wholesale rate. This proposed change will extend the solar payback period and reduce the return on investment. McCain states that “In order to benefit from the burgeoning clean energy economy, Illinois needs a package of clean energy policies that work together. We cannot have one policy that encourages growth and others meant to suppress it. These mixed signals will keep Illinois from enjoying the economic benefits that other states economies are already benefitting from”. For a brief audio policy update on the benefits of net metering to the grid, click here. ISEA's 2016 Solar Lobby Day was a success! ISEA hosted a joint Clean Energy Reception at Maldaner’s Restaurant the evening before Solar Lobby Day with the Union of Concerned Scientists and the Respiratory Health Association. Over 60 clean energy advocates, business owners, legislators and their staff all enjoyed the opportunity to network and tour the impressive solar installation on Maldaner’s roof! 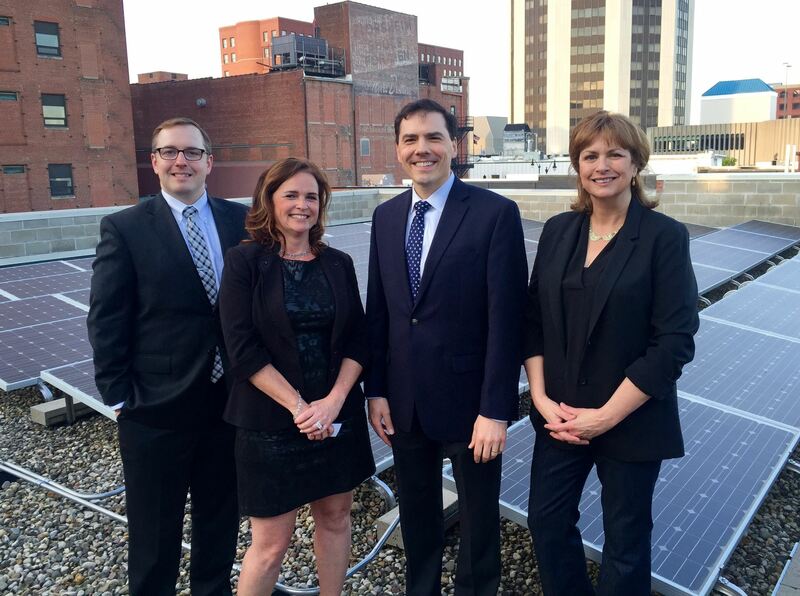 Above: Donovan Griffith- Illinois EPA, Michelle Knox- WindSolarUSA, Rep. Tom Morrison, and Lesley McCain- ISEA Executive Director enjoying the rooftop installation at Maldaner's Restaurant in Springfield. Thank you to the 44 Clean Energy Advocates that attended ISEA’s 4th Annual Solar Lobby Day! 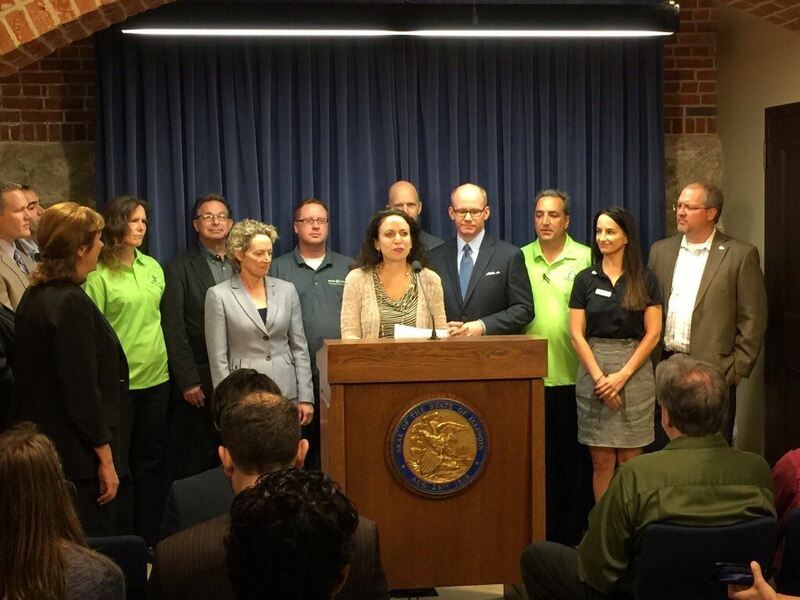 ISEA Executive Director Lesley McCain (above) and Lisa Albrecht (below) speak at a Solar Lobby Day press briefing. 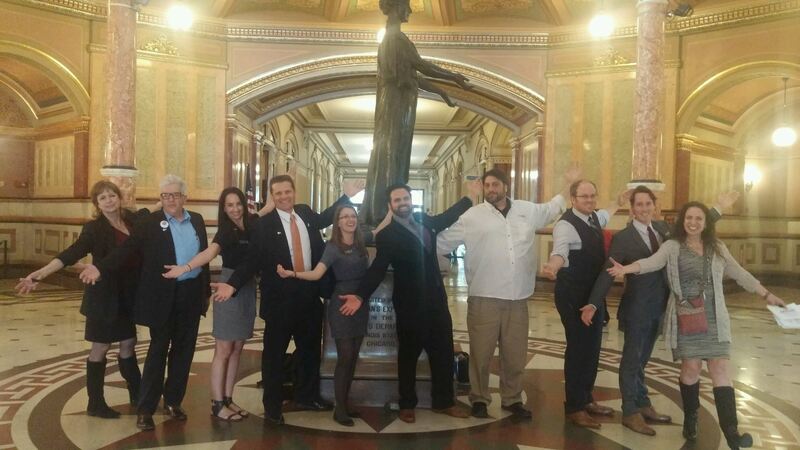 This group of enthusiastic business owners and solar supporters met with a total of 36 legislators and educated them on the economic benefits that the Illinois Clean Jobs Bill will bring to the state! As more Americans are switching to sun powered energy for their home, the solar energy installation industry is growing to keep pace. How are you supposed to differentiate the quality installer from the deceptive contractor? Although there is no sign of rampant abuse in the industry, a few bad apples can spoil bushel! The BBB only receives a few hundred complaints about solar in the US each year. Which is a very small percentage of installers. In every industry there will be contractors that do shoddy craftsmanship to get the work done faster and cheaper for a fatter bottom line. The most important tool homeowners can utilize to protect themselves is education. As with any home improvement, the more you know about what is being done, the more you can watch for warning signs. Below is some initial information to help get you started. Each state has its own requirements for solar installers. In addition a certified electrician is required to pull permits for the work. This can also be the installer or a subcontractor. ISEA Member - Member companies are committed to education and policy in Illinois and also offer homeowners a complaint resolution process. NABCEP certification - This is the gold standard for solar installers. NABCEP Certified installers have the experience and knowledge to design and build any system. If your installer is not an electrical contractor or doing 100% of the work, then they will be subcontracting some of the work. You should find out who this is, what their craftsmanship warranties are, and possibly ask for referrals. If any of the work is subcontracted you should make sure to get a lien release before the final payment so that they can't hold payment against your house or building. fair payment schedule for both parties. We advise not to pay the contractor all of the money up front. Citizens Utility Board - nonprofit organization created by the Illinois state legislature to work for lower rates and better service from utility providers. SEIA's Consumer Guide - SEIA is the parent organization to the ISEA. This insightful download will empower you with the education to make smart decisions from financing to contracting terminology. On Thursday, April 14th ISEA hosted a Lobbying and Advocacy Training Webinar. This webinar was presented in conjunction with the Illinois Environmental Council and A Renewable America, and discussed real-world skills to help navigate the Capitol complex, refine and improve your message. View the recording to learn how to speak to your legislators on issues that matter to you! 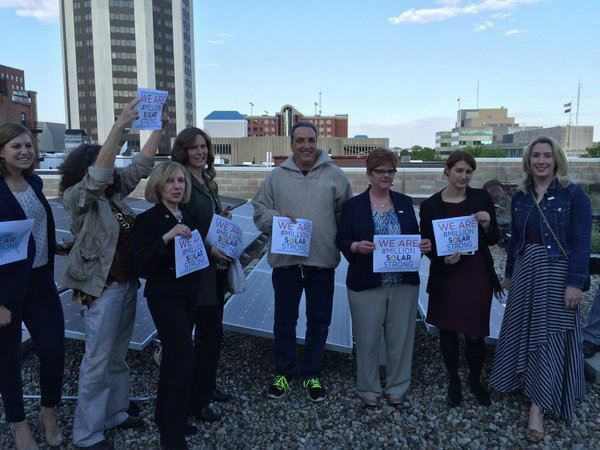 Prepare to join ISEA in Springfield May 4th for ISEA's Solar Lobby Day! As you likely saw, we are very proud to announce that the Rebate/Grant program, originally set to expire in December 2015 has been extended to December 2020. It is vital to note, however, that like all state programs, it is currently unfunded and therefore the program for the current fiscal year has not been released. Without a budget we are uncertain when the DCEO will publish rules or begin accepting applications. In fact, we do not know if there will be a program this year or not and recommend that individuals interested in purchasing solar this year do not count on receiving funding. For more information, please go to the DCEO web page. While on the subject of the State Budget, some system owners who were awarded RECs in the 2015 procurement auctions have expressed concern about the delay in their initial payments. The absence of a 2016 Illinois state approved budget has delayed payment of any of the states bills including payments for the RECs purchased in the procurement auctions. The funds allocated for the procurements is in a secured fund and protected from budget sweeps. All REC owners will receive all of their SREC payments, once the budget issues in Springfield are resolved. We suggest that you ensure your aggregator is still tracking your performance so that once the stalemate is resolved they will be able to bill immediately without issue. “This notification is to inform you that because a State of Illinois budget for Fiscal Year 2016 (“FY 16”) has not yet been adopted, the Illinois Power Agency (“IPA”) is experiencing a delay in the processing and payment of invoices. Further, the IPA’s processing and payment of invoices will continue to be indefinitely delayed until a FY 16 State of Illinois budget is officially adopted, or an appropriation for the Agency is otherwise approved into law. Please note that both the budget prepared by the Governor and the budget passed by the General Assembly (and subsequently vetoed), contained appropriations for the IPA. Further, because all IPA operations are funded by Special Funds (and not the State’s General Revenue Fund, which has been the primary focus of the lack of agreement on the State budget), the IPA expects that when a budget is finally adopted, it will include the appropriations required by the IPA to meet its contractual/financial obligations. The IPA has posted the following schedule for the next auction. Please note that aggregators may close Part 1 earlier than this date. This procurement will have two categories: Speculative/Identified Systems <25kW and Identified Systems >25kW. There is a goal that 50% RECs be procured from the <25kW category. The total budget for this round is $15M. 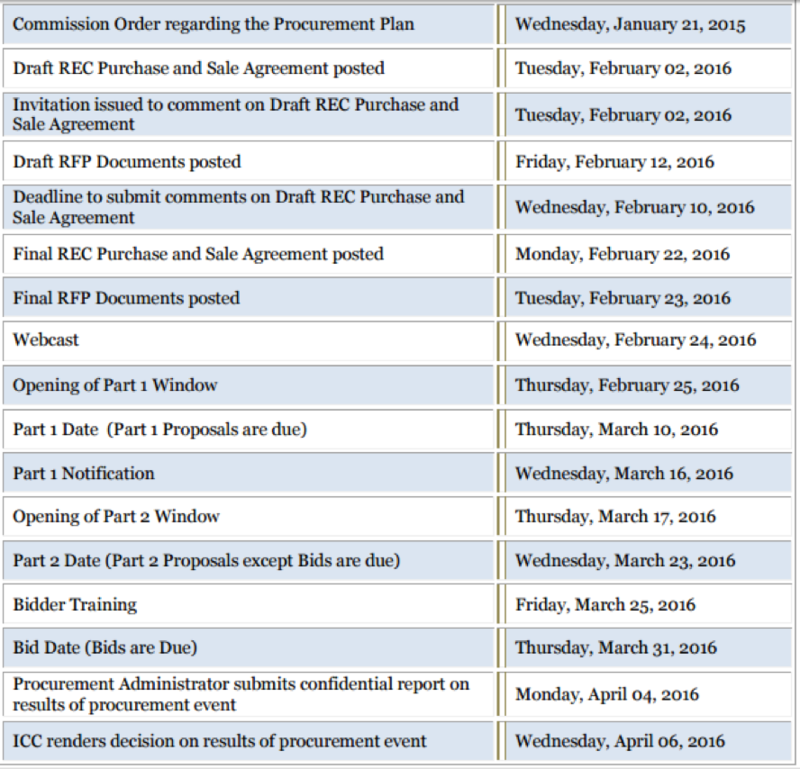 UPDATE: SRECTrade has extended the deadline to submit applications for Round 3 of the Illinois Supplemental PV Procurement.The new deadline is Friday March 4th, 2016 at 5 p.m. CST. All application materials must be received by this date. Incomplete applications, or applications submitted after this deadline, will not be eligible for the Round 3 Bid. To finalize your registration, please login or create an account on SRECTrade.com. Carbon Solutions Group is accepting systems for the Supplemental Procurement. Their deadline for identified systems and speculative bids is March 8th. To register your system with CSG please click here. If you would like more information on this round of the Supplemental Procurement and how to participate with CSG visit this page on our website. 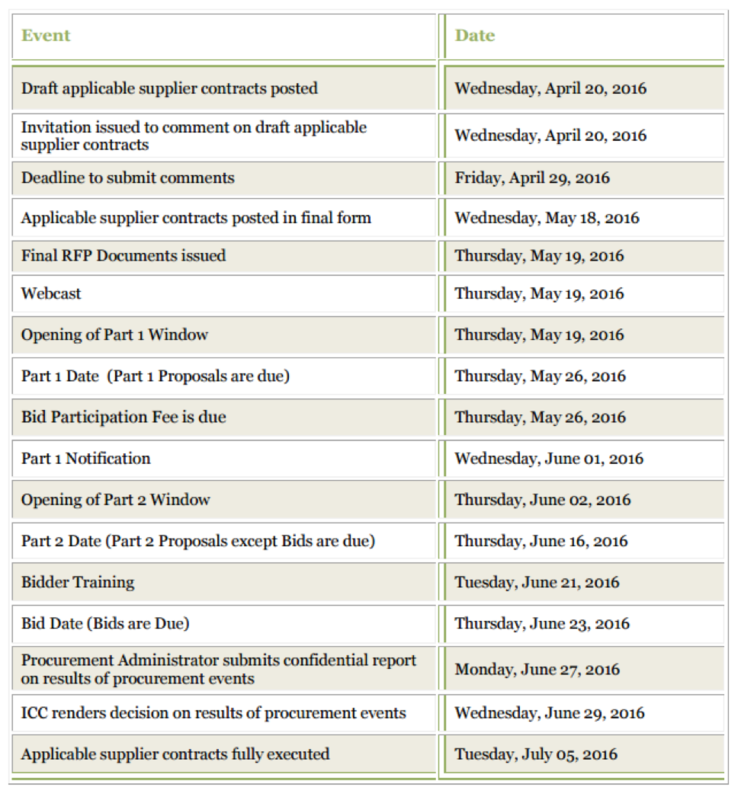 The IPA has also posted the following schedule for the next auction. Please note that aggregators may close Part 1 earlier than this date. This procurement will have two categories: Identified Systems <25kW and Identified Systems >25kW. Speculative systems are not permissible in this event. There is a goal that 50% RECs be procured from the <25kW category. Bidders must total at least 1MW. Smaller system owners must work with an aggregator. Carbon Solutions Group will be bidding on this project and interested parties should fill out this form on their website or contact them directly @ contact@carbonsolutionsgroup.com for assistance. Investment Tax Credit (ITC) passes both houses of Congress & The Illinois State Rebate & Grant program is extended to 2020! It’s a Bright Day for Solar! Both the Federal ITC & the Illinois Solar & Wind Rebate Programs have been extended! The passage of the ITC extension ensures a strong and vibrant future for solar! Congress has passed a spending package that includes multi-year extensions of solar and wind tax credits, plus one-year extensions for a range of other renewable energy technologies. Under the legislation, the 30 percent Investment Tax Credit (ITC) for solar will be extended for another three years. It will then ramp down incrementally through 2021, and remain at 10 percent permanently beginning in 2022. President Obama is expected to pass the bill into law by the end of the day. This ITC extension provides stability for longer term plans and allows the industry to ramp up solar in a sustainable way. Illinois State Rebate & Grant Program Extended to 2020! ISEA is pleased and excited to announce that our efforts to get the Illinois DCEO Solar and Wind Rebate & Grant Program extended are a success! Last spring ISEA worked with the Illinois Environmental Council to introduce a bill to extend the state rebate and grant program that was due to expire at the end of 2016. The organization also hired Lobbyist John Kamis to assist in this effort. The bill has passed both the Illinois House and Senate and Governor Rauner signed the bill on December 3rd. ISEA will now work with DCEO to help develop the structure of the program. Support ISEA with your tax deductible membership or donation! Your financial support of ISEA is critical to the continuation of our work to ensure a strong, vibrant solar market in Illinois! Membership dues and donations to ISEA are tax deductible. 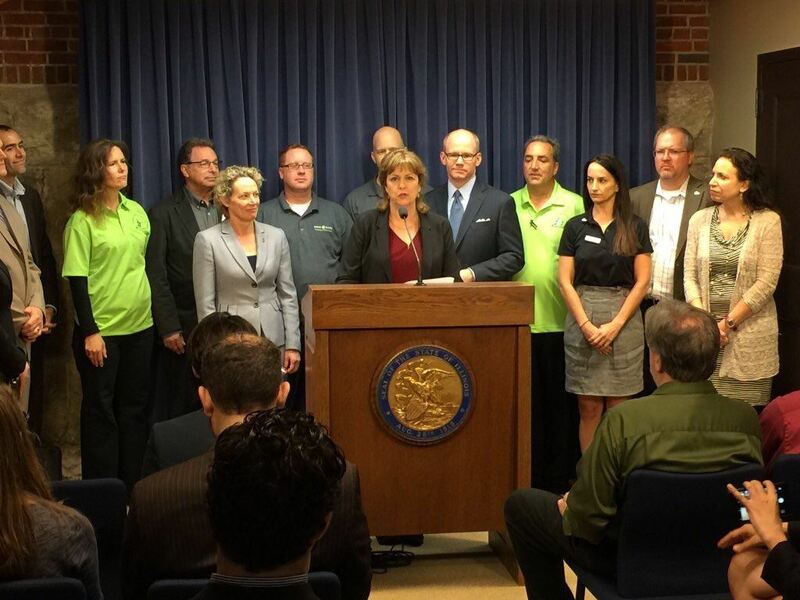 149 businesses call on Governor Bruce Rauner to bring more innovation and investment to Illinois, and create thousands of new jobs, by joining Governors of both parties supporting the EPA's Clean Power Plan and by backing the bipartisan Illinois Clean Jobs Bill. Lisa Albrecht on the Mighty House Radio Show! 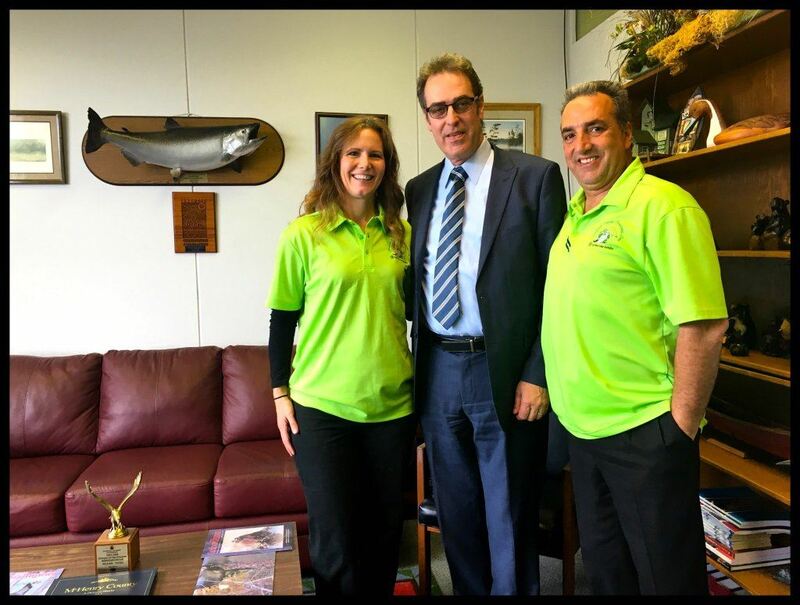 ISEA Board Member Lisa Albrecht was a guest on The Mighty House Radio Show! This show is put on by ISEA business member Ron Cowgill of WinSol Power Company. Take a listen as she explains Solar PV and answers some frequently asked questions.